Don’t usually post these things, as Joni Mitchell put it ‘being part of the star-making machinery’. 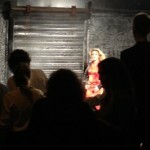 I had a chance to sit in on Shakira filming a video. It was a fun.